Guys, holy crap, guys, it's Barbie monkeyflippin' Race & Ride. I know with all the great games always coming out, it's important to have reviews to reference so you can figure out which games are right for you, so here I am, reviewing this Playstation Barbie game. And chances are that unless you're a five year old girl, this game isn't for you (and even five year old girls ought to be playing better games than this). 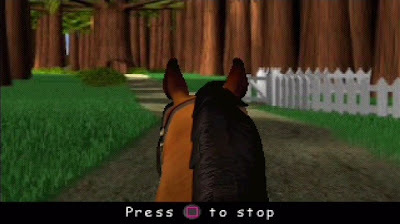 Essentially what we've got here is a horse game where you race and - get this - ride around one of five scenic trails. 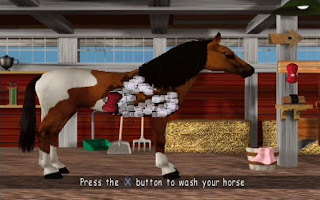 Before that though, you get to choose from one of four different horses which you can name, just as long as the name you want is one of the preset options that Barbie knows how to say. 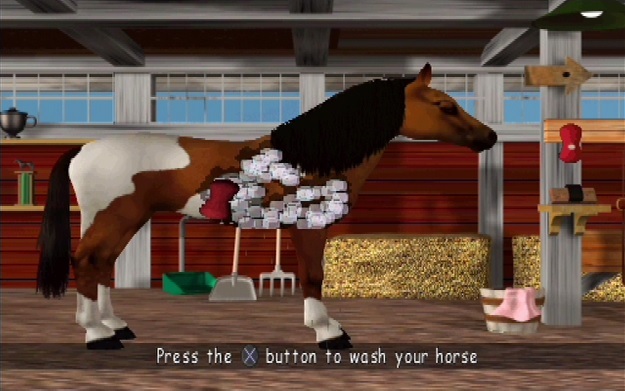 Also outside of the trails, you can feed your horse, put on its riding gear, and wash it! All of these things have no effect whatsoever, but Barbie assures me that giving the horse a bath is "so much fun". In fact, all throughout the game, Barbie feels the need to comment out loud about how cute, fun, or pretty whatever we're seeing or doing is. It's as if the game is self aware of how un-cute, un-fun, and un-pretty it is and has to desperately reassert that it's worth playing as often as it can just in case the player starts to have second thoughts. Yes, please. I could stop any time now. The main part of the game is out on the trails, which each consist of a day segment and a night segment. For Playstation 1, the graphics aren't all that bad, but that's because almost everything is pre-rendered. Being pre-rendered, it's also only slightly more interactive than a DVD menu. For the most part, the game plays itself and the only influence you have over your horse is making it speed up, slow down, lean to the sides, or jump. There's never any reason to go slower than full speed and leaning to the sides is only useful for avoiding the very occasional obstacle and otherwise does nothing but make your horse look like it's going to the side. Jumping is also just used to avoid obstacles, which will only slow you down and make you try jumping again if you run into them. Get the rabbit to the carrot by guessing the correct holes. If you guess wrong, you start over. Along each trail are various points of interest that you can stop and examine. Many are as simple as watching an animal run around and make a noise when you click on it, but there are also a few minigames, which are all incredibly simple and mostly based on guessing until you win, and a couple boring races (these have a 2-player option, by the way). These little stops are also a big part of the game, should you choose to stop at them, and they show off how crappy this game is better than anything. On each trail, there are two minigames in particular that, when completed, will give you a fragment of the postcard that unlocks the final level. Completing the final trail will reward you with a heartwarming cutscene of a foal. How nice. Essentially this game is just an interactive video of a horse running through pre-rendered environments with a few terrible minigames thrown in. 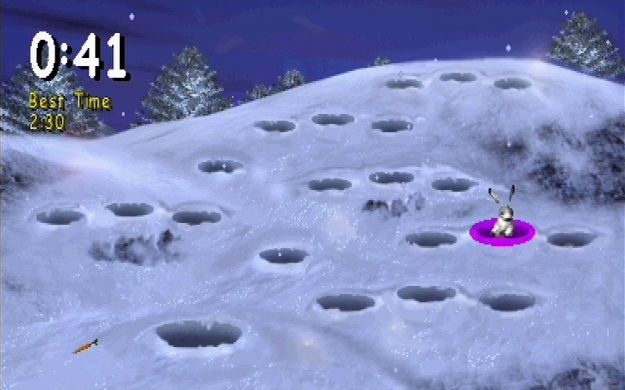 The visuals and sound effects that show off these locations aren't actually that bad, but Barbie's incessant comments and the game's overall lack of interactivity really bring the quality down. Parents, if you feel the need to follow gender stereotypes and buy your daughter a cute, pink game, try getting an actually good game like Kirby or something. Or, if it's about the horses, let them ride around in Shadow of the Colossus. Almost anything would be better than playing this game. For another horrible game, check out Home Alone on NES.